THE weekend officially starts at 5.18pm on a Friday. That is the ­precise moment when the feel-good factor of having two days off work kicks in. At this exact time, according to a survey, employees put the worries of the working week behind them and start looking forward to their plans for Saturday and Sunday. A quarter of people questioned told researchers they immediately felt happy when they shut down their computer on a Friday afternoon, while for a fifth it was when they picked up their children at the school gates. For one in six, sitting down to watch their favourite soap opera with a glass of wine indicated the start of the weekend, according to research by frozen food makers Ross Burgers. Ross Burgers is also launching ‘Fun Time Friday’, helping mums celebrate the start of the weekend. To learn more about ‘Fun Time Friday’ and find hints and tips on how to make the most of your spare time with the kids, follow Ross Burgers on Facebook at www.facebook.com/rossburgers and Twitter @RossBurgers. 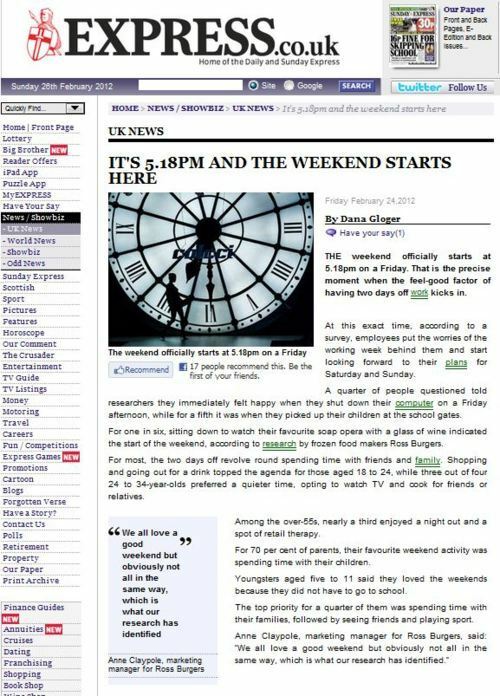 Things are now a little clearer – Ross Burgers want to become synonymous with fun weekends, hence their new ‘Fun Time Friday’ promotion, which explains why they’d seeding press releases into the news which encouraged people to think about what they look forward to on a Friday, and to link that with the Ross Burgers brand name. This also explains why the main website for Ross Burgers is at the URL http://burgerfun.co.uk/, I guess. Genuinely bizarre, but that didn’t stop the Daily Express lapping up their press release with relish. Relish. ‘Cos they do burgers, you see? This entry was posted in Uncategorized and tagged Anne Claypole, daily express, Dana Gloger, Ross Burgers on February 29, 2012 by Michael Marshall. Local papers last week were keen to dispel the myths around acupuncture, given that many people are apparently unaware of the health benefits of the needle-based therapy. Which is almost certainly because there are no health benefits of the needle-based therapy. Do you miss the whole point of acupuncture? WITH Acupuncture Awareness Week just around the corner one Thame specialist is keen to help dispel some of the myths and misconceptions. A recent survey by OnePoll revealed that many people still do not understand the possible benefits the health treatment offers. The poll was commissioned by OnePoll, for the British Acupuncture Council, who want you to think that there are health benefits to acupuncture and if you don’t know what those health benefits are, you should ask during Acupuncture Awareness Week. This entry was posted in Uncategorized and tagged 72 point, acupuncture, British Acupuncture Council, onepoll, survey, Thame Gazette on February 27, 2012 by Michael Marshall. Ah, excellent – so http://bad-pr.tumblr.com/rss then! This entry was posted in Uncategorized on February 25, 2012 by Michael Marshall. is there an RSS-feed for the tumblr stream? Erm, not sure! I’ll look into it! You really do have to feel sorry for the poor, poor man who was voted ‘Britain’s Most Under The Thumb Bloke’ this week. The award is said to make up the ‘big three’ of the awards season, along with the BAFTAS and the Oscars. ‘I’m truly under the thumb’: Is this Britain’s most henpecked man? He watches girly box-sets, wears boots because his partner saw them on TOWIE, and he always sits down to go to the loo so his other half doesn’t have to lift the toilet seat up – meet Britain’s most ‘under the thumb’ bloke. Henpecked Mike Jeffries, 25, from Eastbourne, East Sussex, always has to sit down when he goes to the toilet so his controlling other half Joanna Felicitas, 23, doesn’t have to put the seat down later. 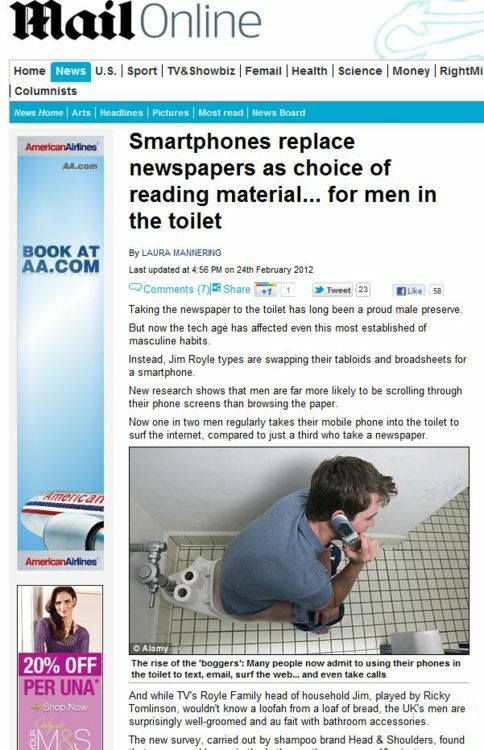 Mr Jeffries admits his fiancee, who he proposed to in 2009, carries out regular spot checks during his trips to the loo – and even phones him if he takes too long. Aaaand so it goes on, with claim after claim about how under the thumb this poor chap is said to be. But what’s behind this story? After a six-week hunt for the most henpecked man in the country, organisers at lads mag Zoo and Brighton based The Stag Company were in no doubt that Mr Jeffries should beat thousands of entries to land the dubious title. …the online home of the stag do, The Stag Company, who have been sending the groom-to-be on tailor-made stag weekends for the past decade. And what prize did Mike get along with his title? The story starts to get clearer – The Stag Company launch a search for the most outrageous stories, offering a decent-sounding prize to the couple with the most outrageous stories, and eventually find a couple with a very outrageous story. It might well be that everything Mike said about his girlfriend Joanna is true. Or it might well be that they embellished and exaggerated in order to win the prize, and The Stag Company were happy enough for this to happen as it gives them a better story to sell to the Daily Mail. My guess would be that Mike is not quite so extremely under the thumb as he’s made out to be, but that he and Joanna are canny enough to spot a way to win a competition when they see one – and good luck to them if that’s the case. Whether the stories Mark and Joanna tell are all true, or are exaggerated to win a competition, what’s undoubtedly true is that the whole competition – and the article in the Daily Mail – exists only to let you know that if you’re looking for a stripper-laden stag do, there’s a company who can do that for you. This entry was posted in Uncategorized and tagged daily mail, Eventa, Joanna Felicitas, Mark Jeffries, men vs women, The Stag Company, Zoo on February 24, 2012 by Michael Marshall. They are the quintessential moments that make James Bond such a very special agent. Fans of the 007 movies all treasure their own favourite memories that encapsulate their hero, whether it’s Little Nellie, Bond’s one-man autogyro from You Only Live Twice, or our suave spy dressed to kill in his dinner suit. And now, to mark 50 years of the film franchise, a survey of movie-goers has revealed their 50 essential Bond memories. The survey of 1,000 fans was carried out by insurance firm esure. The company’s Nikki Sellers said: ‘Bond is famous for the actors who play him, the villains and, of course, the girls. Insurance firm esure clearly know that sometimes, just being mentioned alongside something well-loved is enough to incrementally increase perception of your brand. While nobody will overtly read this article and decide to choose esure as their insurance company, aligning the esure brand with the Bond brand is enough to add a little drip of extra warmth to the way people feel about esure – over time, this subtle effect will spur people to look favourably on esure as a brand. This entry was posted in Uncategorized and tagged alignment, daily mail, esure, james bond, nikki sellers, survey on February 23, 2012 by Michael Marshall. Misleading satnavs have caused more than £200 million worth of damage to cars in the past 12 months, it was revealed today. Accidents caused by drivers going the wrong way have led to damage totalling £203 million in the past year, the poll also showed. As you can see, this was a story placed by Confused.com via their PR agency Cake, in order to promote their brand new sat nav blackspot locator. Ramblers are getting lost because many no longer have basic map reading skills and rely on smart phones and sat navs, mountain rescuers have warned. For generations, the most essential piece of kit for any rambler tackling Britain’s mountains and moors has been a map. But for modern hikers, it seems, this is no longer the case. Experts have warned that traditional map-reading skills are now on the decline, with sales of paper charts slumping. Ordnance Survey says sales of its paper maps have dropped by 25 per cent since 2005, to 2.1 million last year. Over the same period, mountain rescue incidents in England and Wales have increased by 52 per cent, to 1,054 in 2011. So, half a million fewer maps are sold, and five hundred more people required mountain rescue assistance – therefore there is a causal link here, and that causal link is the use of sat navs. This appears to be the argument being made here. Which would be fine, if there was data to back that up – but at the moment, we’re given only anecdotal linkages. And who compiled these figures? Perhaps there may be a genuine argument that a rise in sat nav reliance leads to a rise in ramblers needing rescue – however, this story, despite being sold on the assumption that sat navs are to blame, says nothing about any link to sat navs. The links being made are to the fall in ordinance survey sales – but falling sales in maps doesn’t mean that ramblers aren’t buying maps any more, it just means that fewer maps are being sold. Is the fall in map sales reflected in the rambler community? We’ve no idea, the research hasn’t been done. Until it is, we can’t say anything at all about the effect having a sat nav in your car has on your ability to ramble. This entry was posted in Uncategorized and tagged confused, daily mail, Ged Feeney, Jasper Coping, Rob Waugh, sat nav, survey, telegraph on February 22, 2012 by Michael Marshall. With children flying the nest and more free time than ever, those turning 50 would be forgiven for thinking they might be able to kick back and enjoy their golden years. But according to a new study, the tough times are only just beginning. A new study has found that those celebrating their half-century are about to enter the most expensive stage of their lives. said the Daily Mail, at the start of a scare story about the shocking finances of the over 50s, and how expensive life gets once you’re past the half-century. The article was derived from a press release from Benenden Healthcare Society – in fact here’s the press release (another effort from OnePoll/72 Point). Marc Bell added: ‘Life is getting tougher for the over 50s. The increased costs places extras pressures on the wallet, but it can also put greater pressure on mental wellbeing and the strength of relationships. ‘In the midst of this greater expense, we should not forget to prioritise our personal health. It is perhaps the time of life when maintaining good health is most vital – therefore ensuring a secure future for our family. So ‘even though you’re skint, don’t skimp on the healthcare or your family will be screwed when you die’. Wonderful. This entry was posted in Uncategorized and tagged 72 point, benenden, daily mail, onepoll, survey on February 20, 2012 by Michael Marshall.